Jon Storms is the kind of guy who lives for tires, and cars, and engines. He knows the automotive industry like the back of his hand. He was raised in this world. You might even say he was named for an auto repair business… Because he was! In 1974, his father, Tom Storms, started Johnny Wheels. Tom eventually grew that business into the largest automotive service provider in the London-Corbin, KY area. Along the way, in 1976, his son, Jon was born. Named for the family business, Jon practically grew up in an auto bay. He had a playpen that was made out of tires. He had changed his first tire by the time he was 8. His passion for this line of business is unparalleled. Given his family-owned company and its position in the region, he seemed destined to grow old in Corbin, KY pursuing his passion as a critical member of Johnny Wheels. Sadly, opioids interrupted that destiny. After 15 years of addiction, fueled by “roxies”- the street name for Percocet- Storms career in the risky and expensive world of automotive technology seemed at an end. He had tried rehab before. He had been in jail. It wasn’t working. Storms’ life was at a standstill, like some stranded car sitting on the shoulder on I-75 with a bright orange tag, warning whoever might care: this vehicle would soon be impounded. Then he entered Addiction Recovery Care in July of 2017. Over the next 12 months, Storms received intensive treatment at Sanibel House, an ARC facility located near Ashland, KY. He credits that facility with saving his life… Literally. ARC has a philosophy of treating clients with four dimensions. It addresses their clinical or addiction-related issues with counseling and groups (NA, AA). It treats their psychological needs. It helps them find vocational opportunities (more on this later). And it helps with their medical needs. With qualified doctors, nurse practitioners and nurses on staff, ARC finds their professionals are in high demand. That’s usually because clients have let medical issues go for years while focusing on their addiction. For Storms, his health conditions were unrelated but no less severe. Following a failed surgery, Storms had an emergency episode that required a Nurse, Stacy Stevens, to perform an emergency procedure while ARC was engaged in a company-wide worship service. Saving Storms life was one thing. Keeping him from relapse during a more extensive cleanup surgery at UK was quite another. Being cut from stem to sternum would cause anyone to reach for pain medication. For someone in recovery, this poses quite the quandary. Storms knew he had relapsed once before, following surgery in his hometown. He worried what would be the effect now. He credits ARC and the support of center staff with keeping him clean during this dangerous period. “When you’re in rehab, we’ve got this recovery bubble that keeps you going. Without it, on no pain medications, I would have gone back to using.” With it, Storms made it through. As clients start improving in their addiction, they face the overpowering urge to return home, to family and friends. Storms longed for Corbin and the family business. He especially yearned to be closer to his son, Slater, and his brothers, Bill and T.R. The urge to go home was made that much worse when his father died during treatment in May 2018. ARC had given him a new home. He stresses to point out, again in teaching mode, that his new home wasn’t as comfortable at first, but that’s ok: it was safe. Safe is good, but Storms still yearned to be doing what he loved. He felt his destiny was in the automotive industry. However, a new destiny had snuck up on his blind spot and was threatening to pull ahead: somewhere along his recovery road Storms had realized he wanted to help others into and through recovery. How could he reconcile the two? Enter Tim Robinson, James Keaton, and Second Chance Automotive. Robinson, the founder of Addiction Recovery Care, had a passion for vocational treatment. He knew the company was spending hundreds of thousands of dollars on a fleet that transported clients to and from court, treatment centers, and worship services. It was always in need of maintenance and often repairs. Tim began to talk to James about the potential for those in recovery to manage the needs of the fleet and learn a skill at the same time. When they learned about an intern at Sanibel House who knew his way around the auto industry, a plan began to hatch. 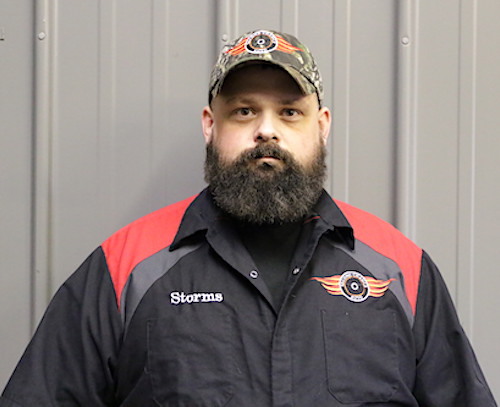 Fast forward to December 2018, and Second Chance Autos was born, with Storms at the helm as Service Manager. His dream of helping people and simultaneously feeding his passion for all things trucks and cars have joined into a single mission. “We give folks a new lease on life. Second Chance has several phases. We are a full auto garage for the public, and bodywork internally.” Eventually, Second Chance will do bodywork for the public. The shop offers a discount for ARC employees and plans to be a full-fledged vocational program where those in recovery can come in, get certified as Automotive Service Excellence Techs- the gold standard for automobile techs- and go out and find a career anywhere they’d like. ARC advocates that the key to recovery is not just sobriety, but helping clients find their destiny. Destiny can be the key that unlocks long-term recovery. That belief is validated when you talk to Storms. “I have a love for doing this. A passion I cannot even explain. I wanted to go home so badly to the family business.” Now, he says, he’s where he belongs. By January, Second Chance is expected to have a staff of 9. Later next year, he hopes it will consist of an additional 8-16 workers who are focused on their recovery and going through ARC Phase 4. Storms has lofty goals for the new program. He thinks about the things Tim and James and Jason Damron have done to support him. He considers his recovery friendships. He knows he’s found a new home and his destiny. Read your article. I’m very proud of you and know your Dad would say the same thing. He prayed for you to find your way through your darkness.